Pictured with their finished totes are: Alyse Borelli, Morgan Finn, Kate Fonte, Elaina Bolles, Maggie Rustowicz, Mary Kate Petz, Lily Cultrara, Maddy Mitchell and Kayla Myers. Members of Junior Girl Scout of Troop #1019, in response to the Girl Scout Motto: “Do a Good Turn Daily”, spent their winter helping the Asbury Shalom Zone of Buffalo get its newly established Multi-level Girl Scout troop up and running. The communities of Shalom have been set up by the Global Ministries of The United Methodist Church to restore and renew communities by building healthy relationships, and meet human needs. What better way to meet the needs of the youth of Buffalo than to set up a Girl Scout troop? While each Shalom Zone parent is taking classes in preparation for employment, to finish a GED, learn English as a Second Language or update their computer skills, the scouts of the new Buffalo troop can be building self-confidence for their own futures. It’s a perfect match! So, for the past few months, the nine girls from Grand Island Troop #1019, under the leadership of Mary Jane Fonte and Lee Burns, have been busy sewing the tote bags for the girls of the newly formed troop to use in transporting their treasures and paperwork to and from meetings. Then, using the money earned from selling Girl Scout Cookies, they filled them with arts & crafts supplies and general stationery needs for the troop to function. Handmade cards were then added that share messages of inspiration containing words such as: Achieve, Explore, Believe, Dream, Reach, Choose, Discover, Lead and Change. The girls, in turn, received the Girl Scout Bronze Award for their commitment to a better tomorrow. 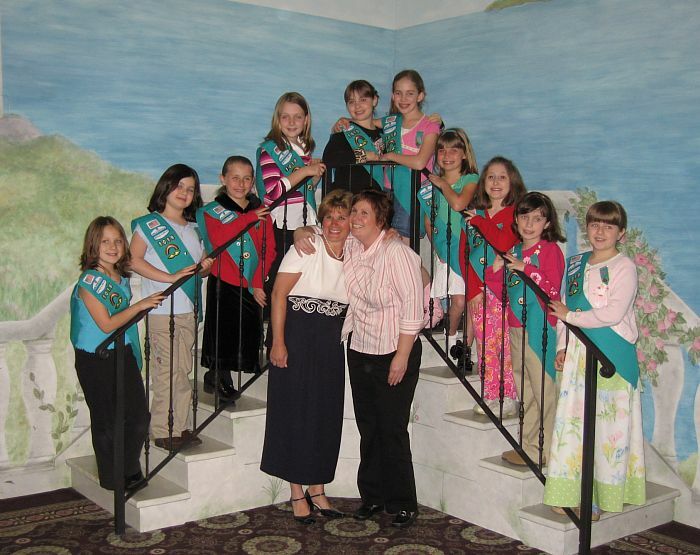 Members of Brownie Troop 1019 bridged to Junior Girl Scouts on April 27, 2006 at Antonio's in the Falls. While in Brownies the girls have done many service projects, including Jammies for GI's, making hats for cancer patients, and donating cookies to the elderly. 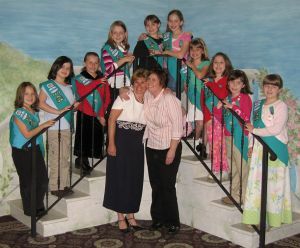 This troop has essentially been together as a group since Daisy Scouts and is led by Mary Jane Fonte and Lee Burns. "Come grow with the Grand Island Girl Scouts." The Grand Island Girl Scouts will hold a "Daisy Tea" for girls entering kindergarten in September 2006 and their parents/guardian. The Tea will be held at 6:30 p.m. Thursday, April 27, 2006 at the Island Presbyterian Church, 1822 Huth Road. Parents are strongly urged to become involved with their daughter's troop. Girl Scouting is only possible if there are volunteers to help. For more information regarding the Daisy Tea, leadership, or other Grand Island Girl Scout programs, contact Barbara Klock, 773-7208. The Girl Scouts of Grand Island have the following events taking place. For more information, contact Service Manager Barb Klocke at 773-7208.  Thinking Day – February 10, 2006 at Connor Middle School Cafeteria 6:30-8:30 p.m.
 Girl Scout Carnival- March 25, 2006 at St. Timothy Church, Stony Point Rd. Have you ever wanted to be a Girl Scout Leader but didn’t know what it entailed? Well the Girl Scouts of Grand Island would like to talk with you. We are starting a Leader in Training program where prospective leaders would be mentored by experienced leaders to gain the knowledge needed to have your own troop. The only qualifications needed are that you be 18 years of age and have a desire to work with girls from the age of 5 through 17. You need not be a parent of a girl who wants to be in scouting. This would be good experience for someone who wants to work with children, be it in education, athletics or social activities. If this sounds like something you would be interested in, please contact Barb Klocke at773-7208 or Lisa at Girl Scout Council in Buffalo at 837-6400 ext. 272. Grand Island Brownie Scout Troop #957, on September 21, 2005, took part in an international art and literacy project: Pinwheels for Peace. 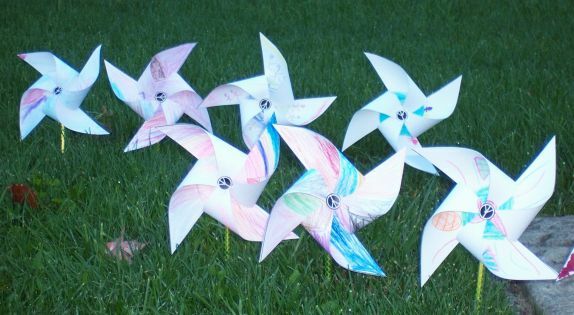 Pinwheels for Peace is a non-political art installation project started by two art teachers in Coconut Creek, Florida, as a way for students to express their feelings about what’s going on in the world and in their lives. Groups in over 1,011 locations throughout the world have committed to spinning pinwheels on September 21, 2005. The Brownies created pinwheels and wrote their thoughts about peace and love on one side and drew their feelings on the other side. They then assembled these pinwheels, which were “planted” on the International Day of Peace outside of Sidway School. Hopefully the spinning of the pinwheels in the wind spread thoughts and feelings of peace to those who saw them throughout the town, country, and the world! For more information, click www.pinwheelsforpeace.com. Girl Scouts of Grand Island will be enrolling new scouts during the month of May 2005. If you have a daughter who will be starting Kindergarten in the fall, she will be at the Daisy level. If your daughter will be in grades 1st through 3rd, she would be at the Brownie level. If your daughter will be in grades 4th and 5th, she would be at the Junior level. If your daughter will be in grades 6th through 8th, she would be at the Cadette level. "We are always looking for leaders and it is a rewarding experience to be involved with scouting," a spokesman for Grand Island Girl Scouts said this week. Information and enrollment applications will be coming home this month via your child’s school and or preschool. For further information contact Barbara Klock at 773-7208. Looking for something fun to do this summer? 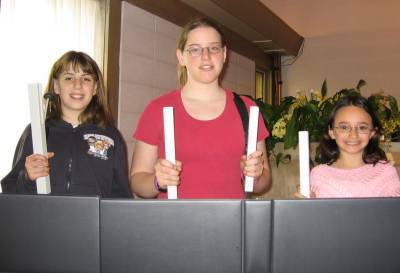 Choir Chime and Hand Bell Summer Camp, sponsored by Cadette Girl Scout Troop #1023, will be held Monday-Friday 9 a.m. to noon beginning Monday, August 22, 2005 and continuing through Friday, August 26 in the Island Presbyterian Church, Huth Road. There is a $10 registration fee. This musical week is for people of all ages interested in learning and playing Choir Chimes and Hand Bells. No previous musical experience is required! If you can count you can learn to play. Grand Islander Brent Minet will teach Choir Chimes to children completing 1st through 5th grades while Tom and Jan Peters will instruct Hand Bells to those entering 7th grade through adult. Friday night, friends and family will be treated to a grand concert presented by the camp members. Registration is open from June 1- August 5, 2005. The $10 registration fee includes a t-shirt. Click Registration Form. Grand Island Cadette Girl Scout Troop #1023 is hosting the summer music Program at Island Presbyterian Church, Grand Island for their Silver Award Project. The Silver Award is the second highest award a Girl Scout can earn. Girls must dedicate a minimum of 30 hours towards a project that directly contributes to their community, young girls or Girl Scouts. The Girl Scout Council of Buffalo and Erie County has approved the Gold Award project submitted by Grand Island Senior Girl Scout Troop #958. This project involves the development of a theater camp for youths in grades 3 through 8 that teaches the fundamentals of theater performance over a nine-week period beginning Saturday, January 15, 2005. The approved project, called Bringing Experience in Acting to Students Through Theatre(B.E.A.S.T.T. ), will be conducted on Saturday mornings from 9:45-11:45 a.m. at St. Stephen’s Church, Baseline Road, in the Hospitality Room. Eligible students must be in grades 3 through 8, have an interest in theatre arts, and are willing to make a commitment for the duration of the project which runs through March 12, 2005. There is no cost to the student and classes will cover topics such as stage make-up, monologues, props, scenery, and warm-up games. Thirty- two students are needed and are on a first come basis. Those interested are encouraged to call 775-3327 or e-mail Querulousyouth15@aol.com with name, age, grade, school, address, and phone number. The Gold Award is the highest award which can be achieved by a Girl Scout with less than 2% of the Girl Scouts achieving this award. The Girl Scouts conducting this theatre camp are Sara Johnson, Toni Kaufman, Ashley Leisck, and Caitlyn Quider. In addition, mentoring will be provided by Danielle Quider and Elizabeth Lesinski, who have both received their Bachelor of Fine Arts in Theatre Studies from Niagara University. Girl Scout mail-in registration forms will be available at the elementary schools beginning May 10, 2004 for all girls wishing to join Girl Scouts for 2004-05 year. Forms will be sent home, and girls already in scouting need not mail in this form as they should have already given their leader a registration form. The Girl Scouts will host a tea for prospective Daisies (kindergartners, Fall 2004) at Island Presbyterian Church 6:30 p.m Monday, May 24, 2004. Call 773-7208 for reservations. For information on meeting sites, leadership, etc., call Barbara Klock at 773-7208. Grand Island Girl Scout Troop 1312 is sponsoring a "new" toy drive this holiday season. All donated toys will go to the Grand Island Neighbors Foundation. The girls have organized this as a service project to help them earn their child care badge. Those able to donate a new toy are asked to call Carol Zimmerman at 773-1055 and she will arrange pick up of items. Last day for donations is December 3, 2003. The Grand Island Girl Scouts are in the process of forming Daisy Girl Scout Troops. This program is designed especially for the kindergarten age girl and is formed around the Girl Scout Promise and law. "It is a wonderful experience and as a Daisy Scout, your daughter would develop social skills, earn "learning petals," take small field trips, be involved in Grand Island girl Scout events and also be a part of the world's largest women and girls' organization," a spokeman for Grand Island Girl Scouts said this week. The Girl Scouts on Grand Island have over 400 active participants. Many activities have been planned for the year, such as roller skating parties, the annual carnival and a sock hop. Individual troops are planning camp dates, sleep overs and other field trips along with crafts and songs and games. Through Girl Scouts, girls develop social skills and experience educational activities. For more information on the Daisy program or other Girl Scout information, call the Service Unit Manager Barbara Klock at 773-7208. 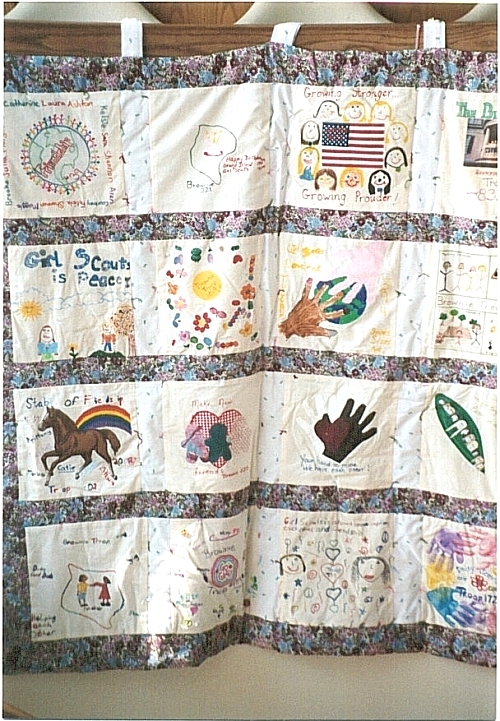 The Girl Scouts of Grand Island, including both Brownie and Girl Scout troops, created a pair of quilts in celebration of the of Sesquicentennial. The ideas and love that the girls put into each square show up loud and clear in this photograph showing a small section. Calling all Grand Island Girl Scouts - The Girl Scouts are scheduled to participate in the Grand Island July 4th parade. All levels of Girl Scouts are invited to attend. A "Decorate the Float" party is scheduled for 6:30 p.m. Wednesday, July 3, 2002 at 2162 Stony Point Road. Girls marching in the parade are asked to dress in patriotic colors and/or their Girl Scout uniform. Parade line-up information will be updated at Isledegrande.com as it becomes available. For more information call Kim Rogers, 774-8334 or Barbara Klock, 773-7208. The Girl Scouts have just completed a very eventful year, with a major project being the completion of a quilt which has been donated to the Grand Island Sesquicentennial Committee. A raffle by the committee will be held with the drawing at the historic pageant, rescheduled for October 19-20, 2002. The old fashioned field day, held at Beaver Island State Park on a beautiful June 8 day saw over 200 Scouts taking part in the games and crafts. A hot dog lunch was provided and everyone in attendance had a good time. Plans are full speed ahead for next year with an encampment for the older Scouts and a possible Victorian Doll Bed Making Party and Tea for the younger girls. For more information on how to register for the Girl Scouting program on Grand Island, call Ruth Blickley, 773-3327 or Barbara Klock, 773-7208. The Girl Scouts on Grand Island have had an exciting year. It is the 90th birthday of Girl Scouts in the United States and the girls have been involved in many new badges and programs. The Girl Scouts have completed two quilts to donate and are working on an Old Fashion Field Day to end their year. An encampment for Juniors, Cadettes and Seniors will take place in late September. Various Island troops will participate in Victorian Teas and overnights doing the 2002-2003 Scouting year. A Teddy Bear tea is being planned for the Daisy Girl Scouts. Girls in kindergarten and older are eligible to be enrolled in Girl Scouting for 2002-2003. Registration forms were distributed through classroom teachers the week of May 20, 2002. Forms must be postmarked after May 28 and no phone registrations will be taken until after that date. Girls in scouting for 2001-2002 have already registered and need not register again. Placements are made on a first come, first served basis. Some of the troops are filled and may not be accepting new members. New troops will be organized at any level if needed and if adult leadership is available. For more information on Grand Island Girl Scouting, or if your daughter did not receive a notice from school, or attends school off Grand Island, please contact Barbara Klock at 773-7208 or Ruth Blickley at 773-3327. 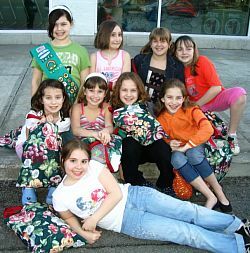 Island Girl Scouts from Troops 46 and 437 will be selling hot dogs and drinks in Tops parking lot from 11 a.m. to 4 p.m. Saturday, May 18 and Sunday, May 19, 2002.